The quinceanera in tradition goes back to the Aztec and Maya cultures celebrating young girls who became eligible to marry, have chldren and to take on womanhood within their local community. It was the Spaniards who embraced the tradition and added it to the Catholic Church, although it is not a sacrament of the church. Some have asked if it is appropriate to skip the church ceremony and only have the reception; most will tell you that the Quinceanera should never be celebrated without the church ceremony. After all this is a spiritual celebration as well, where the princess promises to renew her faith in God by serving her family, community and humanity with honesty and purity as she enters womanhood. 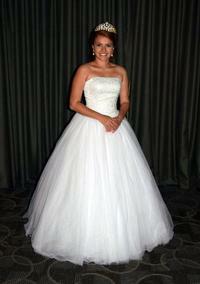 The ceremony can take place at a church, or the venue where the reception will take place. The traditional gifts presented to the quinceañera by her parents and padrinos at her church ceremony hold religious symbolism. The tiara placed on her head signifies her standing as a princess in the eyes of God. The quinceañera earrings remind her to listen to God's word. The quinceañera bracelet represents the unbroken nature of God's love; it is unceasing. The scepter represents her receiving the responsibilities of being a woman. She also receives a patron saint medal, rosary, or quinceañera Bible to remind her of her foundation in faith. These items are her tools for navigating through life as a woman of faith. "Muchas gracias a Usted por acompanarnos y celebrar una ceremonia tan bonita, con un motivo tan importante para nosotros como el cumpleanos de nuestra hija. Quedamos muy complacidos y tenga por seguro que en cualquier evento o celebracion lo recomendaremos y lo tenemos pendiente por si nosotros necesitamos nuevamente de sus servicios." Many of the young girls celebrating are second generation latinos that speak English as their primary language. This makes it ideal for a bilingual ceremony so that all the guests can participate and understand the significance of the ceremony. Rev. 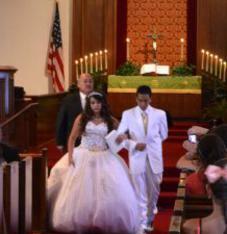 Ron is available to officiate your Quinceanera in English, Spanish, Bilingual or Spanglish. The ceremony and the gifts can be customized to fit your budget. There are no set rules to a Quinceanera; all elements of the ceremony are optional and can be designed to reflect your personality, traditions and beliefs. This might be the question I hear most often these days. Is it ok to have a quinceañera if I am not Catholic? The answer is yes, of course. Most other denominations are beginning to recognize the importance of this event in the life of a young Latina and they are responding with liturgy that is specific to their church doctrine be it Catholic, Christian, or Non-denominational. If you have never seen one in your church, make an appointment to talk to us about it. We are happy to have the chance to talk with young girls, along with her parents, about the importance of their faith as they grow into young women.